The Document Foundation released the third update for LibreOffice 5.4 last week, as you can read on their blog where they write about the new LibreOffice 5.4.3 . My manic-depressive mood-swings are on the manic side at the moment so next to baking sausage rolls (brabantse worstenbroodjes for which I will publish an updated recipe on this blog soon) and a batch of sourdough bread, I finally had the energy to fix the admin interface for the SlackDocs mailing lists, wrestled myself through 14,000+ emails in my administrative mailboxes, wrote a plan to migrate my LAN services from the ageing server to the new server I bought this summer (which involves conversion of several large databases to InnoDB and loads of custom packages), plus I binge-watched almost 2 full seasons of Stranger Things in 3 days’ time. I know I will crash hard in a couple of days but I hope to have a new Plasma ‘ktown’ update before that happens. Their advice for more conservative users is to stick to the 5.3 releases but I am no longer compiling packages for that. In any case, thanks to the 16 cores on my build server it did not take all that much time to generate packages for Slackware 14.2 and -current. When I tried the new programs on my laptop (which is running Plasma5) I noticed that the default User Interface for LibreOffice causes rendering issues. Also, my Plasma5 destop is configured to move application menus out of the application window into a button in the window’s top bar. That setting is apparently not compatible with the default User Interface and it caused the loss of the LibreOffice menu. I could fix these issues by editing the profile script “/etc/profile.d/libreoffice.sh” and un-commenting the line “export SAL_USE_VCLPLUGIN=gtk3” to force LibreOffice to use GTK+3 as the widget set. The libreoffice packages for Slackware can be downloaded from any mirror like this one: http://bear.alienbase.nl/mirrors/people/alien/slackbuilds/libreoffice/. Posted: 12 November, 2017 in Slackware, Software. Thank you Eric! So far the software works OK. I want to mention that there is a visual appearance problem with the LibreOffice and KDE since these last versions, I don’t know which version accurately but I’ve recorded my screen when it happens, when you select right-to-left sheet in the spreadsheet application and try to edit a cell then you see cell rendering is ruined. I appreciate if you take a look, its 57 seconds. Omid I have no idea where the rendering is incorrect. I see a lot of right-to-left strings being entered as well as western text, but I cannot see what is correct and what not. This is something you should create a bug report for if it has not yet been reported: https://bugs.documentfoundation.org/ . After some hours spending, I’ve figured out that the problem was configuration of UI renderer of LibreOffice. formerly UI render was on VLC: kde4 but I’ve solved the problem with adding “export SAL_USE_VCLPLUGIN=gtk3” to the profile so the UI Render will be VLC: gtk3. LibreOffice works slower than before but at least it works fine with right-to-left sheets. It seems to be a KDE bug. Omid your solution to add “export SAL_USE_VCLPLUGIN=gtk3” is exactly what I already mentioned in the main article. Had you not read the full article? Is there a reason for sticking with Qt 5.7 for Slackware 14.2? I sort of remember some discussion about it but can’t seem to find it now. There was a discussion of Qt 5.7 vs. 5.9 on SBo-users mailing lists a few months but that seems not entirely related to your ktown repo. Am I mistaken? Can you or someone else point me to a blog post or some other source of information? I’m asking mainly out of curiosity, and I have a couple of packages that require Qt 5.9, most notably the latest versions of Qupzilla (2.2x), which I started using again (currently 2.1.2, the latest which compiles with Qt 5.7) after reading about its name change and integration into the KDE family (http://blog.qupzilla.com/2017/08/qupzilla-is-moving-under-kde-and.html). Ricardo I don’t want to spend too much time maintaining a ktown repository for Slackware 14.2. I already dropped the 32bit packages and for the rest I will do the minimal effort of compiling whatever KDE packages are released. Not every package can be compiled on 14.2 anyway (digikam is stuck at an older version for instance) and I chose to keep my qt5 package version at the same level as what SBo offers, so as not to interfere with other software people may have installed. But I am really targeting ktown at the bleeding edge, i.e. Slackware-current. Releasing it for 14.2 is only a bonus. Eric, fair enough, and keeping Qt at the same version as in SBo also makes sense. I’m deeply sorry for wasting your time, I didn’t read that article fully. Alien, my friend, after the current update, broke the libreoffice! Antonio just look at any of my repository mirrors. 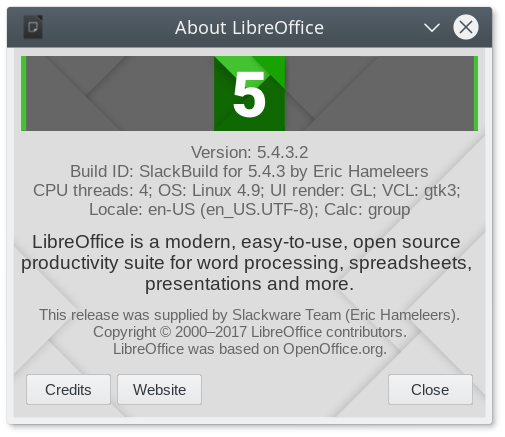 New libreoffice-5.4.4 packages were uploaded in the last hour. So great to see you still slacking, keep up the good work! I’ve installed a little 32-bit atom netbook using your brilliant slackware-live-current dvd version 1.1.9.3 from here:-http://bear.alienbase.nl/mirrors/slackware-live/1.1.9.3/slackware-live-current.iso. I’m using the atom because these are the only cpus supposed to be immune to meltdown (no speculative pipeline). This atom N450 chip only has a 32-bit instruction set. Everything from the livecd runs fine runs fine. Then I installed the 32-bit libreoffice 5.4.4 txz. It fails to run complaining it cannot find libboost_system.so.1.66.0. My system has libboost_system.so.1.65.1. 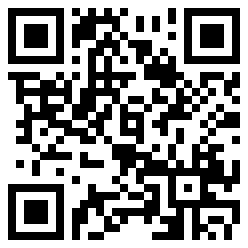 I checked your repo for the libreoffice 5.4.3 txz, intending to try that, but can’t find it. What is the best way to update my system so I can run your libreoffice 5.4.4? Thanks! PS. I should probably have said that I’ve done a full install on the netbook using the setup2hd script, so its running from the harddrive, not as a livecd. I like doing it this way because it lets me test things out in livecd mode first before installing it. steveh the Live ISO you used contains a snapshot of slackware-current dated Nov 22, 2017. Since then (Dec 20, 2017) boost was updated to 1.66.0 and my LibreOffice package was recompiled to pick up the newer boost libraries. Once you have updated your Slackware-current installation to the latest and greatest, you should have a working LibreOffice again. Thanks, I’m running the upgrade now… I’ll report back if it works! Updating to the latest -current level worked a treat. The boost lib is now at the correct level and soffice starts up fine. Only thing missing is that is complains it can’t find a JRE, however I was able to start up “Writer” and “Calc”, I think some functions won’t work because I still need to install a 32-bit JRE. But the basic problem is fixed. Thanks! Using LibreOffice on 32bit Slackware-current (i.e. with a recent kernel) will be problematic if you have Java installed, because of security measures in the kernel. You have to add “stack_guard_gap=1” to your kernel’s boot commandline to overcome those issues. Yikes! – thanks for the warning! Hmm, maybe I can get away without installing the JRE, at least some of LO appears to be working. I’ll do some testing first. If it turns out I need to install the JRE, I’ll add that kernel option. On the subject of meltdown.. I noticed the update has picked up 4.14.14 which is one of the recent released stable kernels containing some meltdown fixes. I’m a little concerned I’m going to see a slowdown on my atom netbook (its pretty slow already!). Do you know if there are any boot option to disable the meltdown fix? From the information from google, all atom cpus made before 2013 are safe, since the cpu design did not use speculative execution, so I should be able to avoid running a kernel with meltdown fixes active. nopti is listed in kernel-parameters.txt, however it is listed as applying to X86_64 and plain X86 is not mentioned. And there is also the “ratpoline” thing… meh, I need to go do some research, I don’t want to take more of your time – cheers. BTW, really you’re doing such a great job doing all this work to keep my fave distribution going (I’ve been using slack since the 90s), thanks so much for making such a big contribution, your homepage is now the first place I always look for anything slack related! steveh – there’s a lot of discussion in the LQ Slackware forum about the recent meltdown and spectre CPU vulnerabilities and what that means for your computer. If you want to know more, join the discussion there, not here as it has no relevance to this blog article.